Back in the 1950s, the City of Providence Rhode Island had a plan to raze part of historic Benefit Street and redevelop it, but the city didn't have the funds. "Providence was too poor at the time for that," says the Rhode Island Historical Society’s Betty Pettine. Sometimes the best urban renewal is that which doesn’t happen at all. Benefit Street is rich in residential, institutional and religious architecture of the Colonial and Victorian eras. Stretching 1.2 miles on Providence’s East Side, Benefit functions as an outdoor museum comprising both grand buildings and simple houses. Downtown Providence lies just to the west, and the campus of Brown University a few blocks to the east. Benefit Street came into its own in the 1780s, almost 150 years after Providence’s founding by Roger Williams, who had been expelled from nearby Massachusetts for his religious views. As Providence moved from rugged religious settlement to thriving mercantile center, it became increasingly congested and needed to expand. Graves occupying the hilly area above the Providence river were moved, and Benefit Street was laid out. The area soon became fashionable, and Providence’s ascendant merchant class built fancy houses overlooking the city below. The largest of these is the John Brown House, now operated as a museum by the Rhode Island Historical Society. "It was something," says Pettine of the massive Georgian style residence, "that Providence had never seen before." The house was completed in 1788 and testified to the vast fortune its owner had amassed as a merchant, a pioneer in the China Trade, and a trafficker in slaves. John Brown was also a fierce advocate of American independence and played a key role in the burning of a British warship. He was later a US Congressman and served as a founder and trustee of the College of Rhode Island, subsequently renamed Brown University after the Brown family. The Browns were split on the issue of slavery - John’s brother Moses, a pioneer in the textile business, became a Quaker and was active in the abolitionist movement. 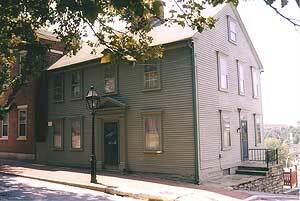 A few steps away from the John Brown House is the 1792 Nightingale-Brown House. At 19,000 square feet, you can imagine its original owner, a wealthy Providence merchant, trying to keep up with the Browns next door. Thought to be the largest North American wood frame house still extant from the 1700s, the building now houses Brown University’s Center for the Study of American Civilization. The Nightingale-Brown house was entirely rebuilt in the 1980s, the money to fund the overhaul coming from the sale of a desk for eleven million dollars. Benefit Street is lined not only with mansions but also with much more modest dwellings in the Federal style. These elegant homes have doors that open right onto the sidewalk. As one strolls past these simple houses -- as one-time Providence resident Edgar Allen Poe used to do -- it’s easy to travel back in time 150 or 200 years. Thanks to the Providence Preservation Society, even "regular" houses have plaques indicating when they were built, and who originally owned or designed them. 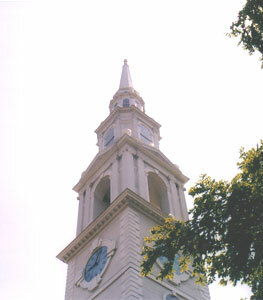 The Brown family is linked not only to the eponymous Ivy League university but also to the Meeting House of the First Baptist Church, the oldest Baptist institution in the United States. The church was founded in 1638 by Roger Williams and the current building, designed by John and Moses’s brother, Joseph, was constructed in 1775. A lottery was established to raise money for this purpose; those who could not afford to participate provided wood from their property. As befits a Baptist church, the interior is modest – no stained glass, crosses, statues or other ornamentation. In addition to the Baptist Meeting House, another notable church in the area is the similarly understated yet elegant First Unitarian Church, whose building dates to 1816. 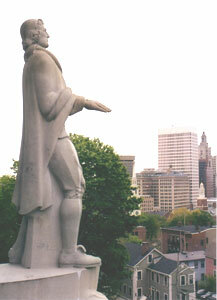 As Providence grew, so did its cultural life. The Providence Athenaeum, a subscription library, was founded in 1753. Its Greek Revival style building, constructed in 1844, is a must-see. 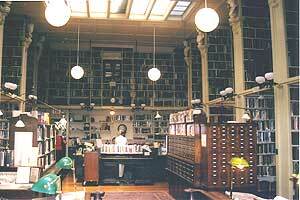 Visitors are welcome; however, one must pay a yearly fee to be an Athenaeum member and have check-out privileges. The Athenaeum in Providence, Rhode Island. Poe often frequented the Athenaeum during the time he spent in Providence in the late 1840s courting Sarah Whitman. The Athenaeum was also a favored haunt of Providence horror and supernatural writer H.P. Lovecraft (1890-1937). Lovecraft wrote the short story “The Shunned House” about scary goings-on at a place just up the street. That 1763 house is still standing and was restored in the 1970s by its current owners. Across the street from the Athenaeum is the Rhode Island School of Design (RISD) Museum. RISD (pronounced RIZ-dee by the locals) is one of the premier art schools in the US; it was founded in 1878 to educate local women in the study of fine arts and design. Its museum is highly rated for its size and well worth a look. There are a number of outstanding attractions on Benefit, but what makes the street so special is that its historic character is found in not just a handful of buildings or on one or two blocks, but throughout its entire length. 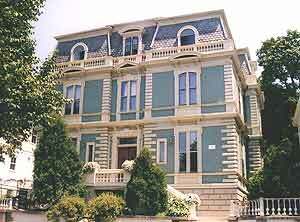 The Rhode Island Historical Society offers 90-minute walking tours of Benefit Street. The tours are offered from June 15 to October 15, Tuesday through Saturday at 11 AM. You can also “self-tour” Benefit quite easily; it stretches from Wickenden on its south end to North Main on its northern extremity. The Shunned House, 135 Benefit Street. 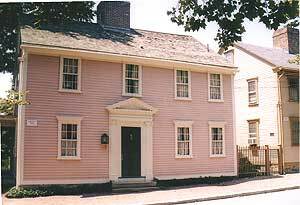 This private residence was built in 1763 and made famous by Providence writer H.P. Lovecraft. Geoff’s at 163 Benefit is an award winning hole-in-the-wall sandwich shop near the north end of Benefit. For more varied dining options try Wickenden Street (at the south end of Benefit), Thayer Street (near the Brown campus), and South Main Street (parallel to Benefit and just down the hill toward downtown Providence). Quahog.org – site compiled by a Rhode Island buff with excellent articles on the Shunned House, the Meeting House of the First Baptist Church, and all things Rhode Island. Tim Lehnert writes for newspapers, magazines and literary journals throughout the US and Canada, including the Boston Globe, the Christian Science Monitor, the Providence Journal, the Montreal Gazette and Rhode Island Monthly. He lives in Cranston, Rhode Island, with his wife and two daughters.